These 5.5 x 16 LLDPE Newspaper Bags help you deliver your newspapers intact without exposing them to moisture These newspaper bags with door knob hang hole help you deliver your papers easier than with rubberbands. 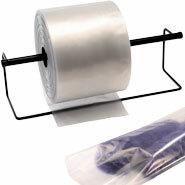 These newspaper bags with door knob hang hole are on a perforated header for easy tear off, 2000 per case. Custom Printing Available.